Come chill out with us at Hearts & Stars Salon this memorial day weekend! Treat yourself to some much needed R&R (services of $50 or more) - and walk out with a FREE H&S-branded Beach Tote or Trucker Hat! 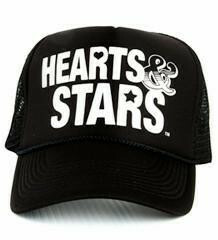 High quality trucker hat printed with the original Hearts & Stars logo. A little piece of history! Available in several stylin' color selections. All natural canvas beach tote with pink or teal printing featuring the new H&S brand and logo. A must for every stylish beachgoer. Offer good through Monday May 26. While supplies last.